Nitrogen deposition in the National Ecological Network (EHS) and in Natura 2000 areas has decreased in recent years. However, deposition is still higher than sustainable threshold levels in large parts of these areas. The main problems are seen in the east of the Netherlands in the provinces with many sensitive natural areas and a high level of nitrogen deposition. The area of nature (EHS) in which the critical nitrogen load was exceeded decreased, from over 80% in 1990 to 70% in 2010. A larger decrease was seen in land-based Natura 2000 areas, from almost 80% to 60%. The difference between deposition and critical load is a measure of the risk of decline in ecological quality, as the higher the exceedance, the higher the risk. The same applies to the length of time for which exceedance takes place. Excess nitrogen deposition causes wild vegetation growth through an increase in fast-growing grasses, shrubs and trees. This results in the decline of plant and animal species that live in open vegetation habitats. The level of nitrogen deposition varies throughout the Netherlands, as does the sensitivity of nature to nitrogen deposition. On the naturally nitrogen-poor sandy soils in the east of the Netherlands, for example, nature is more sensitive to nitrogen deposition than on the clay and peat soils in the west. However, deposition is also, on average, higher in the east of the Netherlands, with relatively higher ammonia emissions from agriculture. 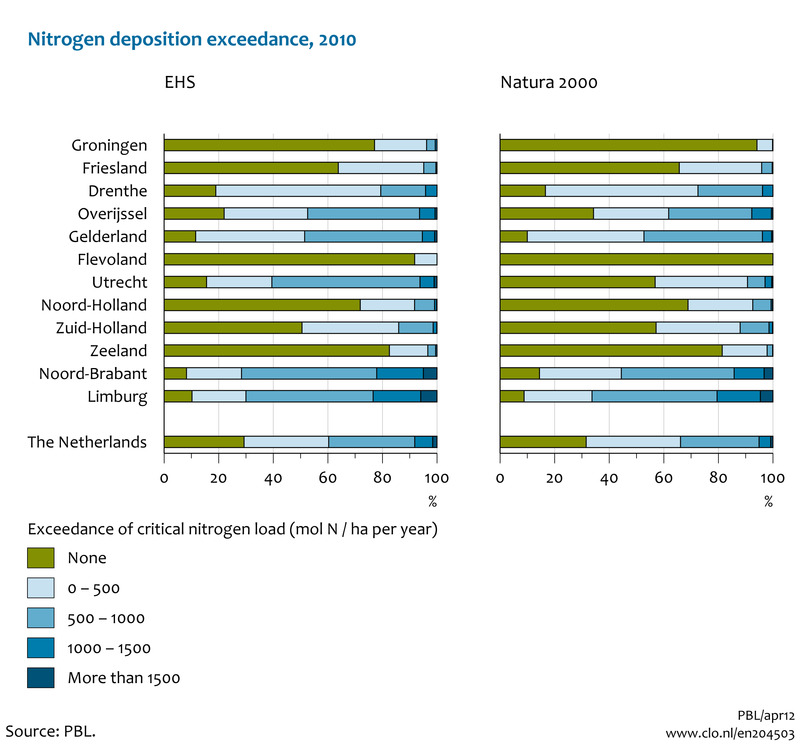 As a result, relatively high critical nitrogen load exceedances are seen in Noord-Brabant, Gelderland, Drenthe, Overijssel, Utrecht and Limburg, compared with other provinces. A decline in deposition in the provinces of Utrecht and Drenthe means that relatively more areas are protected here compared with other provinces. CBS, PBL, RIVM, WUR (2015). Overfertilization in the National Ecological Network, 1990-2010 (indicator 2045, version 03 , 7 January 2015 ). www.environmentaldata.nl. Statistics Netherlands (CBS), The Hague; PBL Netherlands Environmental Assessment Agency, The Hague; RIVM National Institute for Public Health and the Environment, Bilthoven; and Wageningen University and Research, Wageningen.